Savvy Spending: Kroger: Free Annie's Natural Macaroni & Cheese coupon! Clip today, use by 8/19! Kroger: Free Annie's Natural Macaroni & Cheese coupon! Clip today, use by 8/19! 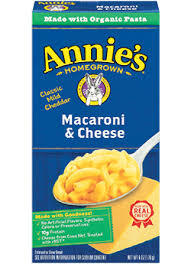 Kroger shoppers can clip a coupon to their savings card for a FREE Annie's Natural Macaroni & Cheese (5.25-6 oz., any variety)! This is available to clip today, August 3 only, and the coupon is valid through Sunday, August 19. Available in most stores.